World no. 109 Félix Auger-Aliassime hasn’t yet established his objectives for 2019, with one exception : he wants to break into the Top 100 for the first time after a left knee injury prevented him from accomplishing the feat at the end of this past season. “I feel like I am that level. I am maybe a few wins away from the Top 100. I have my place amongst those players and I have beaten a few of them already which is encouraging going forward,” Auger-Aliassime said. With four Top 100 victories already to his credit, including two wins over Top 30 players, it’s only a matter of time before he reaches his goal and we can’t wait to see what Auger-Aliassime has in store for us in 2019! Following a five year hiatus, Rebecca Marino made a triumphant return to tennis in 2018. The former world no. 38 rebuilt her ranking in no time, winning five ITF titles during her comeback year, including the Winnipeg Challenger. The Vancouver native also made a return to the Rogers Cup presented by National Bank and reached the quarter-finals of the National Bank Cup, the WTA event in Quebec City. “I am happy that I took the time off. I wouldn’t be the person I am today if I hadn’t, I have no regrets. I am proud of everything I accomplished, I am in a good place in my life right now which is all positive,” Marino reflected. Denis Shapovalov continued to impress in 2018 and proved that he has his place alongside the best players in the world, finishing the year ranked no. 27 and posting nine Top 30 victories along the way. His best performance of the season came on clay in Madrid where he reached the semifinals of the Masters 1000 event. Even though he is still looking to capture his first ATP title, Denis accomplished his goal of breaking into the Top 50 this year. “I am stronger both physically and mentally and overall, my game has improved. Last year, I felt like I had to play my best tennis all the time to win. Now, I just have to be solid and I can beat most of the guys or at least make it tough on them,” Shapovalov said. The confidence and game are there. Two crucial things to have if you’re going to win your first ATP title! Even though injuries stalled the first part of her 2018 season, Eugenie Bouchard showed her fighting spirit throughout the year which helped her win Tennis Canada’s Female Player of the Year and the Heart Award in recognition of her inspiring Fed Cup performance in Montreal against Ukraine. Bouchard qualified for the main draw at Wimbledon and reached the second round before falling to then world no. 17 Ashleigh Barty in a close contest. She produced the same result this summer at the U.S. Open. 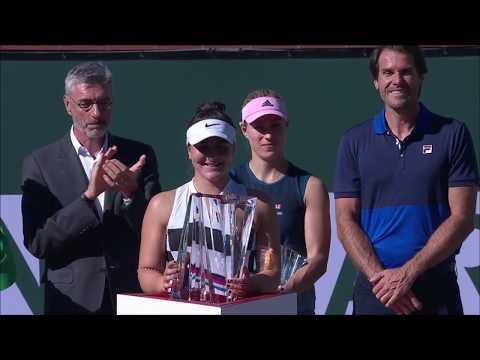 She also reached two WTA semifinals at Gstaad and Luxembourg in addition to a pair of Fed Cup victories in front of her hometown fans at IGA Stadium. Genie’s resilience and perseverance propelled her back into the Top 100. Let’s hope she can keep the momentum going in 2019! After cutting his 2017 campaign short due to injury, Milos Raonic came back strong in 2018. He reached the final of the grass court event in Stuttgart, the semifinals in Indian Wells, and the quarter-finals at Wimbledon for the third consecutive year. His results put him back into the Top 20. Will Tennis Canada’s Male Player of the Year be able to avoid the injury bug in 2019 and continue his rise back up the rankings? Gabriela Dabrowski has won two Grand Slam mixed doubles titles, 8 WTA doubles crowns, and 12 more ITF doubles trophies. One thing missing from her trophy case is a women’s doubles Grand Slam doubles title. Maybe 2019 will be the year! This season, Dabrowski was a quarter-finalist at the Austrlian Open and a semifinalist at Wimbledon for the first time in her career. The world no. 10 in double also qualified for the WTA Finals in Singapore for the second straight year. 7. An injury-free season for Bianca? It was an injury-riddled 2018 for Bianca Andreescu and she hopes that her physical struggles are behind her as looks forward to a new season. The two ITF singles titles she won this fall are proof that the 18-year-old has potential to achieve big things when healthy. A new season is just around the corner and we can’t wait to see our Canadians in action!